Gene Kropfelder (middle) was recently honored with the Charles Taylor Master Mechanic Award. He is pictured with Great Oaks President/CEO Harry Snyder (left) and Jason Forshey. For half a century, Gene Kropfelder has been working on and teaching the mechanics of aircraft. It began when he became an aviation mechanic in the Marine Corps in 1968 and continued in a career with several commercial airlines, as well as Airborne and ATI in Wilmington. He then chose to pass his knowledge on and became an instructor for ATI, and for the past seven years as an aviation maintenance instructor in the adult workforce development program at Laurel Oaks Career Campus. That kind of knowledge and dedication doesn’t go unnoticed. On Feb. 5, Jason Forshey of the FAA came to Laurel Oaks to present the Charles Taylor Master Mechanic Award to adult aviation instructor Gene Kropfelder. The award is a lifetime achievement award presented to those with 50 years of distinguished service, and is named for the Wright Brothers’ mechanic. He knows the importance of skill in his career. “If I would put my wife and children on the aircraft I just worked on, I knew that I did my job,” he said. And that’s the attitude and level of skill he impresses on his students. 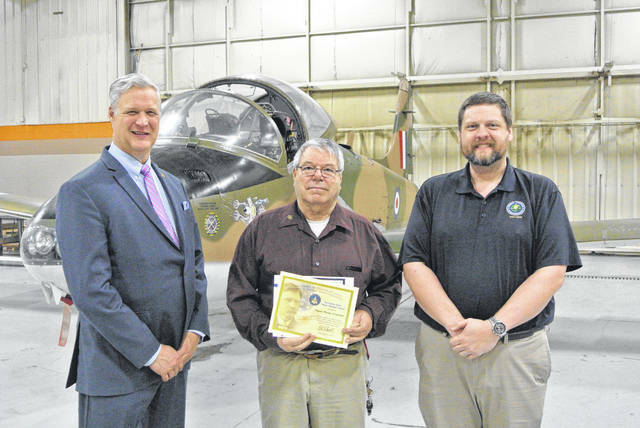 https://www.recordherald.com/wp-content/uploads/sites/27/2019/02/web1_DSC_2799.jpgGene Kropfelder (middle) was recently honored with the Charles Taylor Master Mechanic Award. He is pictured with Great Oaks President/CEO Harry Snyder (left) and Jason Forshey.